This past fall, the Yazdani Studio, along with Gruen Associates and builders Hensel Phelps participated in an invited competition to design a new US Courthouse in the heart of downtown Los Angeles. 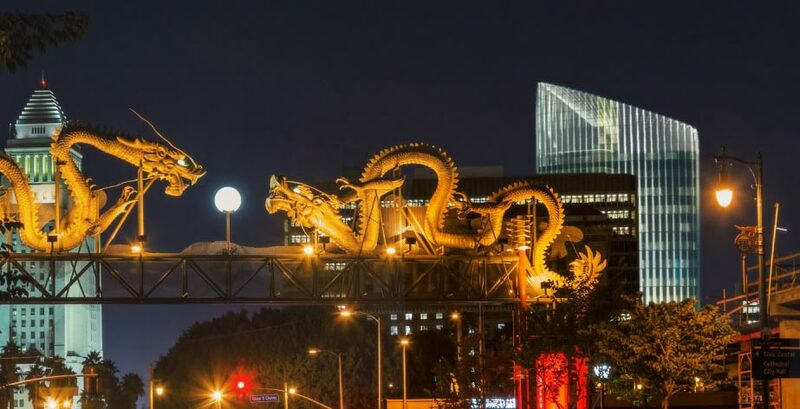 The site for the project is located at the intersection of Broadway and 1st, one block West of the LA times building and a few blocks east of the Walt Disney Concert Hall. 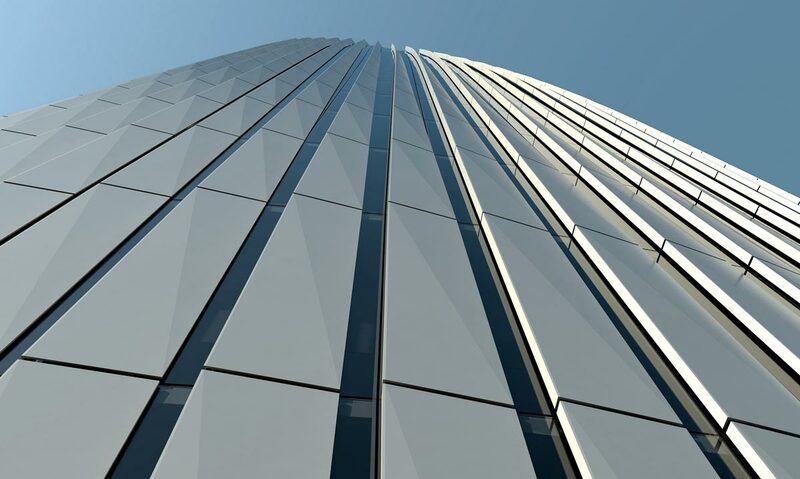 This article will focus on the facade design. To learn more about the competition, the general design approach, and the three competing designs, please visit the LA Curbed website or Yazdanistudio.com. 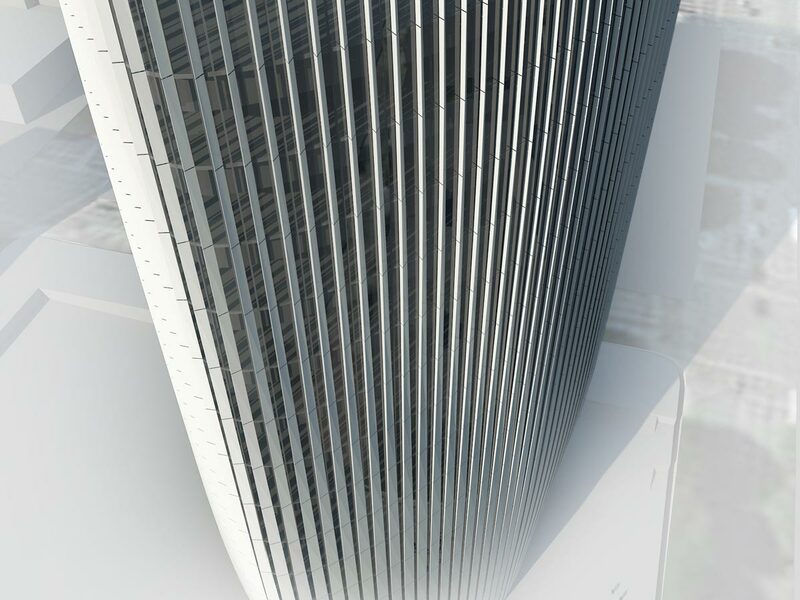 The proposed facade is based on an fixed paratonic system that can balance use, solar heat gain, and daylight harvesting to produce an optimized response to the specific site and program of the project. We begin with site analysis and move on to system design and optimization. Rationalization and conceptual cost estimation will be discussed in part 2 of this post. A site model including terrain and nearby buildings is generated and imported into Autodesk Ecotect for analysis. An incident solar radiation analysis is performed to inform the team how the site and preliminary massing will be affected by solar heat gain. The towers on Bunker hill to the South West are especially relevant as they shade our site in the afternoon for much of the year. At this point in the competition, it had been determined that the team would pursue a tower scheme based on triangular floor plate. 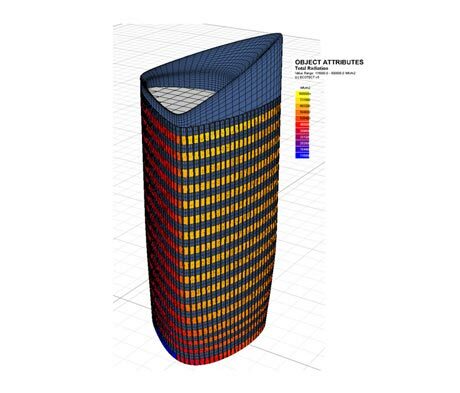 The analysis below compares tower orientation in conjunction with a vertical shading device. The results inform the team that optimal orientation varies depending on the shading device used. The use of vertical fins used in combination with a North/ South orientation produces the most favorable results reducing heat gain by 34%. The solar radiation charts also illustrate that nearby towers on bunker hill shade the building in the afternoon, blocking much of the low-angle western sunlight. Low angle sunlight from the south and south-east is clearly the largest contributor to total solar heat gain for this site. The solar radiation charts used in the graphic above are developed by our research team to allow us to understand both the intensity of the sun’s heat and the direction it is arriving from in a single frame. More info on this graphic and instructions on how to read the chart can be found in a previous blog post “A New Way of Visualizing Solar Radiation“. Because builders and their subcontractors are committing to a total project cost as part of the competition requirements, the design build format of the competition necessitates strict adherence to budgetary limitations even in the conceptual design phase. The budget for this project does not support a kinetic facade or two-skin approach. Instead the team chooses to develop a flexible unitized system that can adapt to local conditions through panel variation. Of the options considered, a unitized system with a triangular vertical projection is selected. The facade is divided into 8′ modules. Each 8′ length represents a prefabricated unitized curtain panel. Each panel is further subdivided into an insulated panel and a glazing unit. 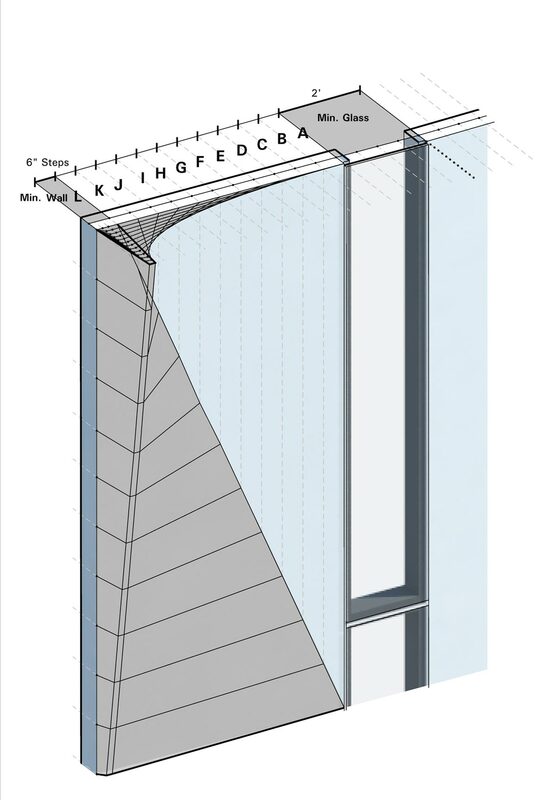 A vertical projection, triangular in plan, is introduced to clad the insulated panel and provide shading where appropriate. Two conditions are left variable to allow for flexibility: the ratio of glass to insulated panel and the depth of the projection. Judges chambers located along the northwest facing facade benefit from larger glass panels up to 7′ wide. Vertical projections in this zone are increased to 2’6″ in order to provide shade for the large glazed areas. The combined effect produces office space that makes the most of natural daylight, requires less cooling, and benefits from panoramic views of the city and Hollywood Hills beyond. Along the southeastern side of the building, glazing panels are minimized to a 2′ width to reduce heat gain. Vertical fins are not effective here so projections are reduced to conserve material. In this manner each section of the facade is considered and optimized to increase daylight, minimize solar heat gain, and take advantage of available views. We run three incident solar radiation calculations in Ecotect to compare the performance of the tuned facade against a “typical” unitized system. This “typical” unitized facade is based on a single generic panel type. To maintain consistency, the generic model is built with the same overall glazed area. The difference between the two models is that glazing and insulated material is strategically positioned in one and evenly distributed in the other. In a third analysis, vertical projections are added to the optimized model. The solar radiation analysis above shows a 3% degradation in performance over a typical repetitive panel. These results are disappointing but expected as this is an integrated system. Larger windows are located in areas where a vertical sunshade will be most effective. Without the sunshade, these openings will produce an increase in heat gain. The third chart illustrates the benefits gained by using vertical projections in tandem with varied openings. 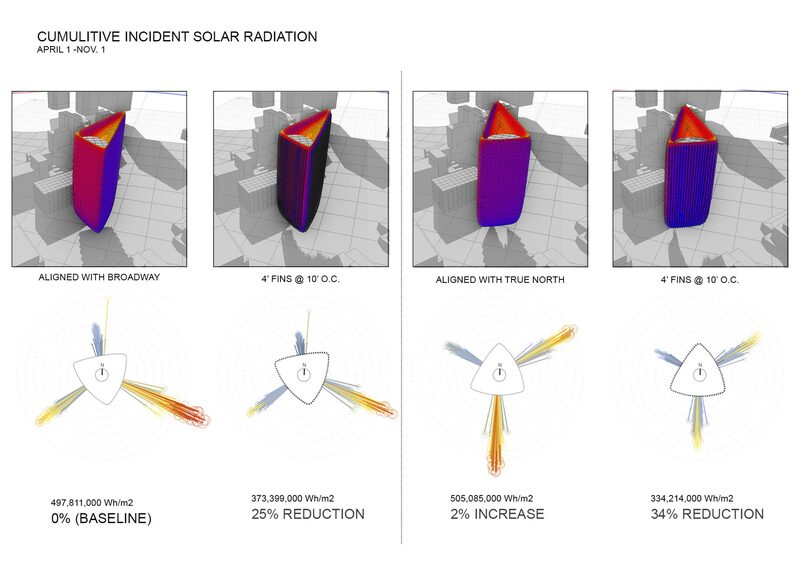 These results show a 5% reduction in total solar heat gain when compared to the typical system in the first analysis. Thumbnails at the bottom off each chart are an attempt to illustrate the increased light penetration that results from larger areas of glazing. These graphics describe how the optimized facade can selectively funnel more light to spaces that need it most while minimizing heat gain. The results above show only a modest 5% reduction in heat gain. A relatively small improvement considering the additional cost that would result from the increased complexity of the system. In part this is simply a product of the competition format. Very little time is available for this type of analysis, and running iterations on further refinements is even less feasible. It is likely that further adjustments in design development would have yielded a reduction in the 10-15% range. In the future, automated optimization tools such as Galapagos for Grasshopper could greatly improve our ability to achieve a more fully tuned solution within the time constraints of a competition. So far, all of the analysis has been based on solar radiation. Increased solar radiation contributes to increased cooling loads. However, cooling load is only part of the total energy load. In most of the US, it is a significantly smaller part than the energy used on artificial lighting. 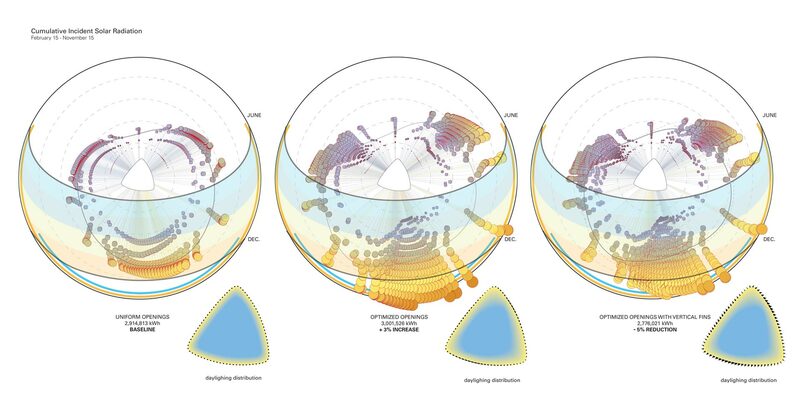 The thumbnail graphic at the bottom of each chart illustrates how more glazing in selected areas could provide greater potential for daylight harvesting in office spaces and public waiting areas where it is needed most. With adequate interior shading and dim-able lighting, this additional daylight can greatly reduce energy use. Unfortunately the daylight graphic is based on “rule-of-thumb” estimation rather than a quantitative daylighting analysis. In the future, we hope to collect this data using a progressive metric known as UDI (useful daylight index) with tools such as DIVA for Rhino. 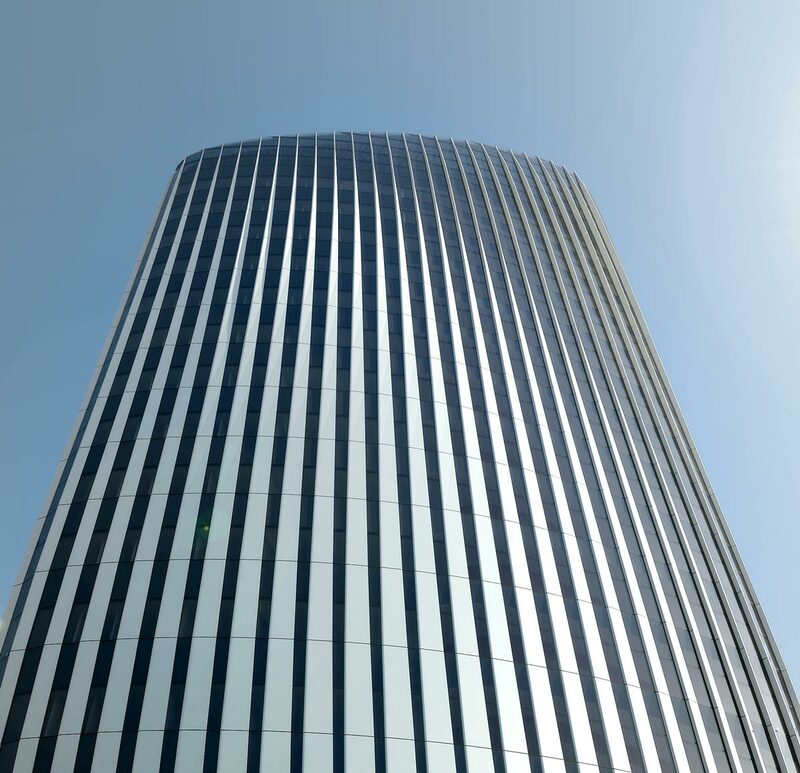 Considering combined energy savings for both cooling and lighting loads can provide architects and engineers with a far more compelling rationale for a responsive approach to facade design. The thoroughness of this project is paradigm. After much research on the topic I continue to return to this blog for its analysis of cross platform interfacing, even more so than its ability to fully close the design loop between concept generation and analytical feedback. One of the analytical steps I continue to look for in your set of beautifully crafted projects is the “internal” incident heat gain the building receives after the façade has been informed by the “external” mesh vertex figures from the analysis software. The only example I’ve seen is from your blog post on the Jeddah Stadium, figure 18, where a post-analysis was conducted, in which you placed a base plane at the field level to measure the shading percentage of your newly adapted skin. This is truly closing the design loop yet I understand it rarely takes place due to the speed of competitions and the ambitious drive to analyze ones work even after the project has been submitted. You guy’s clearly have the ambition. 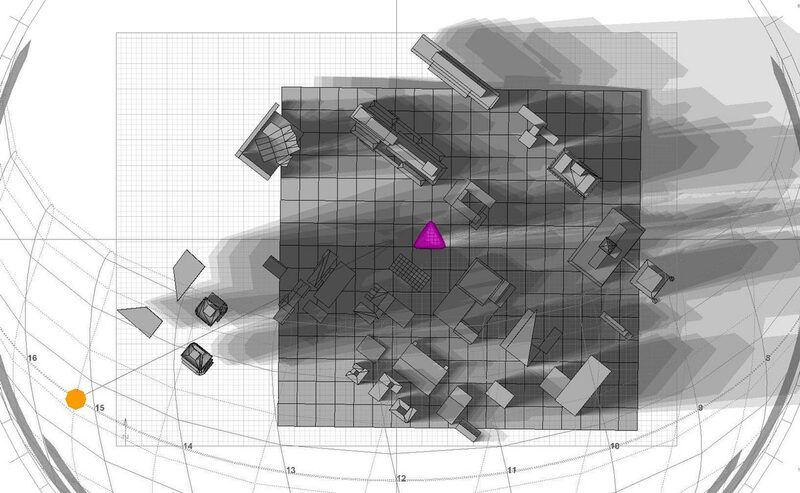 I’m aware that it’s computationally heavy but even a single floor analysis through the center of the courthouse to show the true value of the fins would be nice. HM: Maybe if you hadn’t gone running off to Amsterdam we’d have more time to run more figure 18 style analysis! More seriously, thanks for your awesome contribution to this project. In reply to your point about the internal incident heat gain, we don’t really care about how hot the floor gets. Take a look at the screen cap out of Ecotect above. Notice we only measure the glass. This is the minimally insulated exterior surface of the building where most of the suns heat will enter the space. Once the heat is past the glass the problems begin. People become uncomfortable, load on internal cooling systems increases and more energy is used. To your point, the glass is usually low-E and will end up reflecting some of the heat back to the outside. However, as long as we know the heat gain coefficient of the selected glass type, the amount of heat transmittance is easily calculated. What you really want to know is how much energy is actually saved by our selective shading strategies. We list everything here in terms of percentage improvement and that’s a bit misleading in terms of the bottom line. In the future, I hope we can be a little more explicit in regards to total energy savings. Great work Yan! (I think I already know the answer but …) Was this the only skin system that was investigated, or were there other iterations put through a similar analysis? We did pursue several strategies for the facade. Almost everyone in the studio was involved with this effort so we had quite a few competing facade approaches to consider. We did run the site analysis before the the rotation of the building was finalized and well before we got into the facade development. That data definitely informed the thinking, although other factors, both formal and pragmatic, where all part of the final approach. 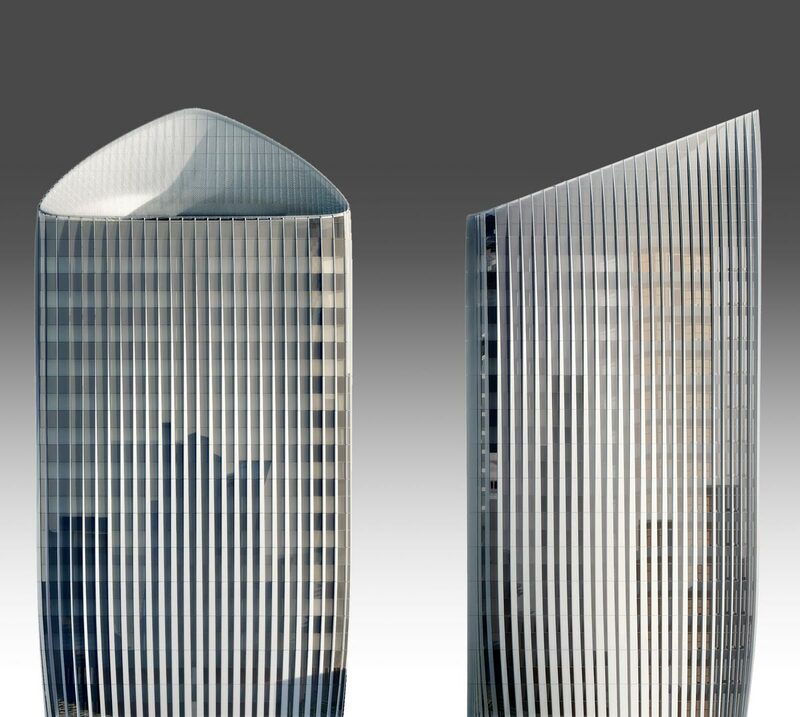 In terms of the facade analysis, that was performed in the final week of the competition. 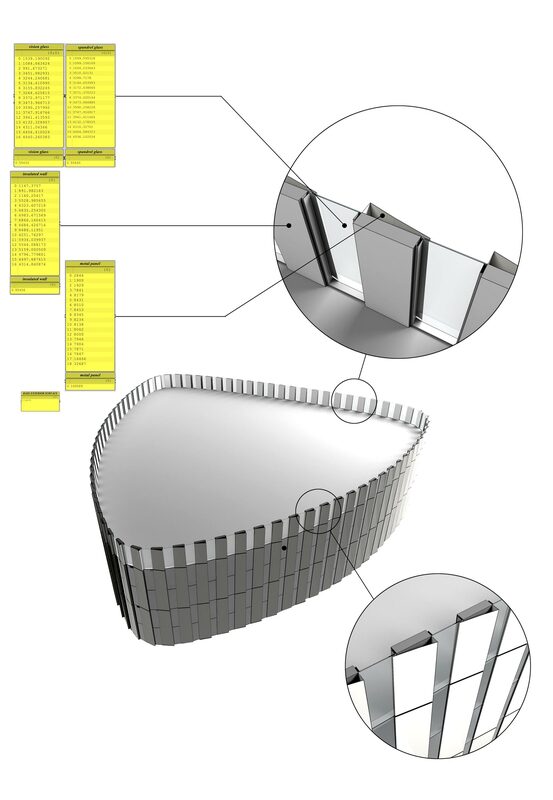 That effort was more about trying to gather data to supported our claims of a responsive, high performance facade system. I think we probably overestimated our ability to tune the system to a high level without a few rounds of analysis to inform the decisions.